SAN DIEGO, CA (March 2014) — The Red Guide to Recovery – Resource Handbook for Disaster Survivors Author Sean Scott gave an informative presentation to Emergency Managers and First Responders at the IEMA Midwinter Legislative Conference in Boise, Idaho in February 2014. The Red Guide to Recovery – Resource Handbook for Disaster Survivors fills a previously unmet need and guides individuals and families through the disaster recovery process. When first responders leave the scene of a disaster, the survivors are usually left to figure out their recovery on their own. For many, this can be the beginning of a nightmare, especially if they haven’t prepared for recovery in advance. The Red Guide to Recovery – Resource Handbook for Disaster Survivors was designed as a road-map to walk disaster survivors step-by-step through the days, weeks, and months that follow a disaster event, while raising awareness of the many pitfalls that often transform disaster survivors into disaster victims. Whether it’s a hurricane, tornado, wildfire, flood, or any other type of disaster few people are prepared for what they may face or understand what the recovery process entails – until now. The Red Guide to Recovery – Resource Handbook for Disaster Survivors is a tool now being used by fire departments, emergency management agencies, relief organization and others as a go-to resource for community resilience and help those affected by disasters rebuild their lives. 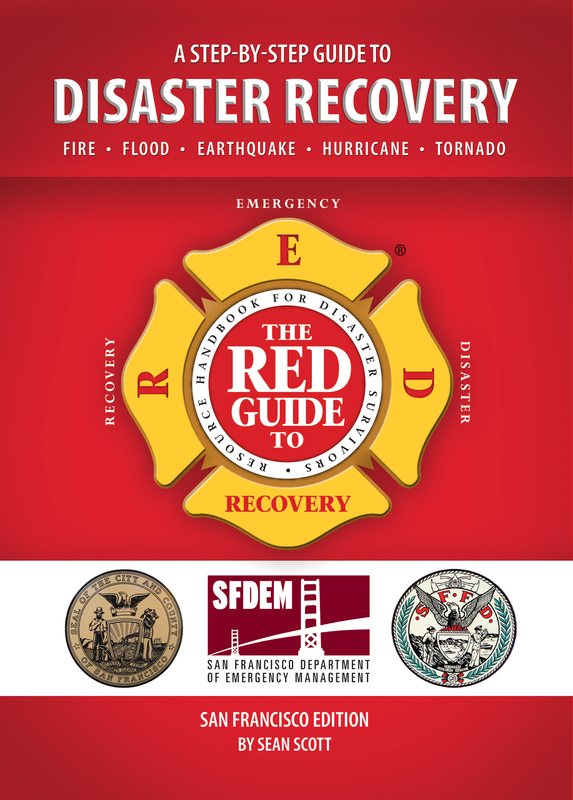 Recently, the California Governor’s Office of Emergency Services, the City of San Francisco, the County of San Diego, the Northeast Region of Colorado, and other communities have adopted The Red Guide and are providing it to their first responders and recovery stakeholders. This allows those who are affected by a disaster to have the information they need when they need it most – immediately after a disaster event. The Red Guide to Recovery – Resource Handbook for Disaster Survivors can be purchased in bulk quantities and/or customized for any city, county, state, or region. Visit http://www.TheRedGuideToRecovery.com for more information. Individual copies can also be purchased from the website. Sean Scott has spent over 32 years in the construction and restoration industry helping thousands of families restore their homes, businesses, and lives. Scott lives in San Diego, California with his wife and two children. Visit http://www.fireflypublicity.com for more information about its public relations services. Firefly Publicity works closely with writers and editors to place products in media like magazines, newspapers, on-line content, radio and television. Public relations is a cost effective way for companies to maximize their marketing or advertising budget. Firefly Publicity is a results-oriented pr firm located in Red Wing, Minnesota. If you’re interested in gaining exposure for your company’s products, please contact Kim Emery at Firefly Publicity. The Mississippi River valley area in Minnesota and Wisconsin is home to hundreds of artists. Some of the finest artists in the Midwest live and work from just south of the Twin Cities to beautiful Lake Pepin. 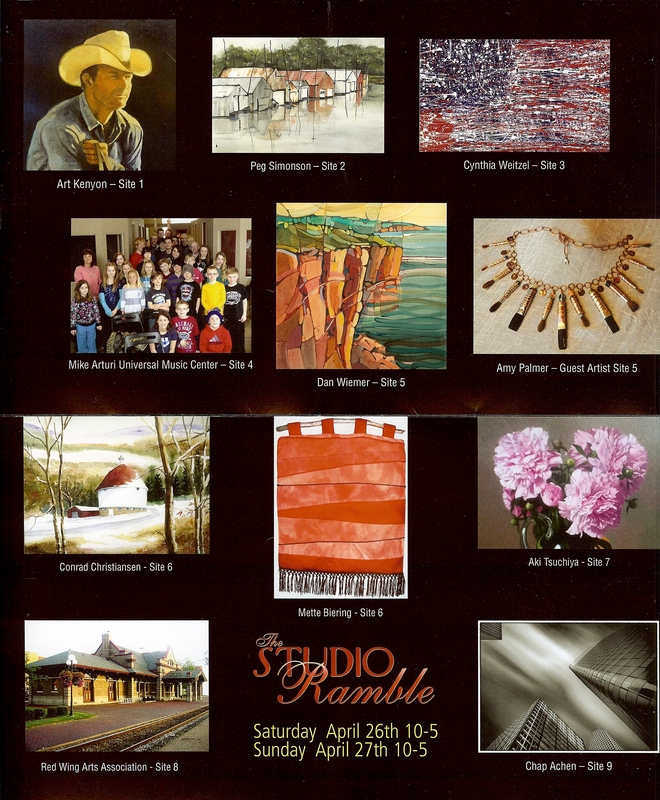 Visit studioramble.com for a map, artist bios and event information. Brochures are available at the Red Wing Arts Association, 418 Levee Street, Red Wing, MN, and local shops. 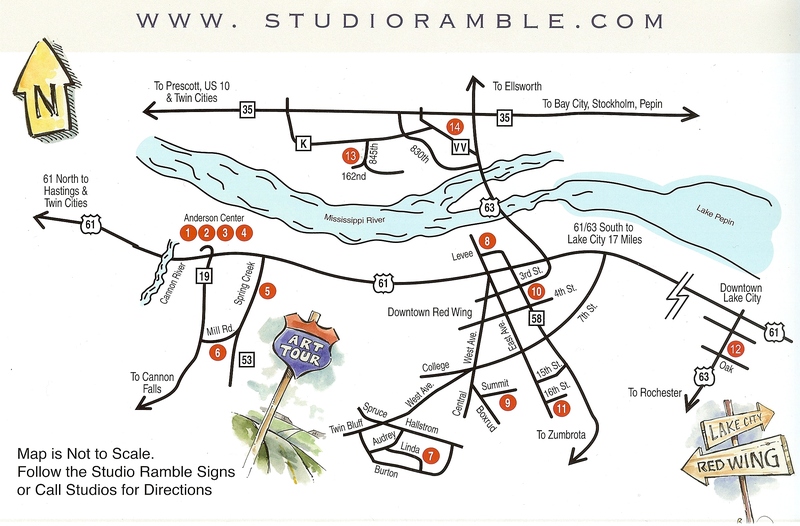 Based in the Red Wing, MN area, Studio Ramble is an annual tour of artist studios. The tour takes place during the last weekend in April. Artists showcase their work and offer items for purchase. 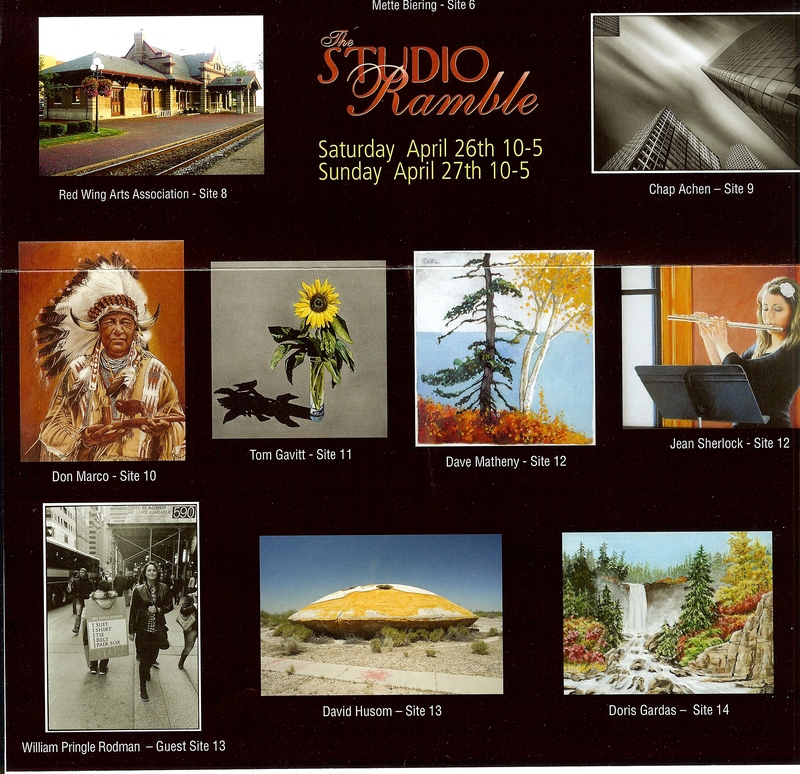 The Studio Ramble is a collaborative effort among local artists. Sites are located in Red Wing and Lake City, MN and Hagar City, WI. Visit studioramble.com for more information. Mike Arturi is a national touring and recording musician whose professional career exceeds forty five years. He is currently drummer for the Rock and Roll Hall of Fame inductee band, the Lovin’ Spoonful. Most recently Mike created and founded the Universal Music Center, a non-profit music school located in Red Wing, MN for which he is the Executive Director. The Universal Music Center offers private one on one music lessons, a monthly workshop and a live performance experience all presented in a positive and supportive environment. Conrad enjoys watercolor painting. He gets his inspiration mostly from nature and likes being outdoors hiking, cross country skiing, canoeing and camping. Conrad also likes exploring creativity and has shared that passion with others as an art teacher. Her love of Nature and the surroundings of her native Wisconsin are the primary inspirations for her work. Drawing at an early age has developed into a life of art whether it involves capturing her grandchildren on canvas or painting the natural world. His self-taught watercolor painting technique began during a European trip in 1982. Tom works in two distinctly different styles relying on sensitive interpretation of realistically rendered subjects in his Eastern painting series and boldly colored, high-key, light filled and loosely rendered interpretations of Native American villages and landscapes in his Southwestern series of paintings. In juxtaposition, the two styles are startlingly different and Tom frequently does shows in which both styles are fully represented. Tom has produced nearly 5,000 watercolor paintings which are represented in private collections all over the world. Tom calls Red Wing home now, but he has also lived in New York, New Mexico, Maine and Arizona over his lifetime. Art is a long time resident of Red Wing who believes in the valuable relationship between drawing, painting, and printmaking. He constantly explores new techniques, styles and compositions to mix detailed realism with abstract forms. His studio displays oil paintings, watercolors, sepia-tone coffee paintings, detailed graphite portrait drawings, and printmaking images from hand-drawn lithographs, Intaglio copper plate etchings, and original hand-rubbed woodcut prints. Visit http://www.artkenyonfinearts.com/ for more information. Don was born in Northern Minnesota in the late 1920’s. Before retiring from his career in Air Traffic Control, Don started developing a technique to create fine art using Crayola Crayons. Shortly after retiring he published his first print. His work has received national attention as well as commissions from Burt Reynolds and a one-man show at Reynolds’ dinner theatre in Florida. Visit mastercrayonartist.com for more information. This husband and wife work in a wide range of media – pastel, oil, watercolor, pen-and-ink, pencil – with an even wider range of subjects: Landscape, fantasy, portrait, still-life, nautical, wildlife, aviation, and much more. He is an illustrator whose work currently appears in a national magazine, Sport Aviation. He was an illustrator with the Minneapolis Star Tribune for over 30 years. She has been painting in oils since childhood. Her originals and prints are in collections around the world, and she is a much-sought-after teacher of drawing and painting. Amy Palmer has created jewelry for over 20 years. Matt Palmer has worked in a variety of mediums throughout his life and began collaborating with his wife Amy about three years ago. The creation of unique and fanciful jewelry is the result of their compulsion for salvaging old objects and materials and their shared passion for design and sculpture. Their jewelry evolves with the objects they find so no two pieces are alike. Peggy’s love of color is apparent as you enter her studio tucked behind the historic Anderson Center. Her painting mediums include: soft pastels, watercolor, where she often incorporates textured papers and ink, and a unique method of painting dyes on silk fabric which are then mounted on canvas. She also hand dyes and paints sumptuous silk scarves using a wide variety of techniques. Akitomo Tsuchiya moved to Red Wing from Nagano, Japan four years ago. He is a painter working in oil, watercolor, pastel, charcoal, pencil and red chalk. Akitomo paints still life, landscapes, portraits and imaginative works of art. His style is basically representational. Most of his work is commissioned paintings. Bold, direct watercolor with strong design best describe Dan’s work. For twenty five years Dan has balanced a career of commercial illustration and fine art. His regional workshops are in demand and his paintings can be found in homes and businesses throughout the country. Dan has a passion for the landscape and draws much of his inspiration from vista views around the Red Wing area. Original art as well as prints and cards will be available. Visit www.danwiemer.com for more information. The Red Wing Arts Association is the oldest arts association in Red Wing, originating in 1952 as an interactive arts educational program. It is committed to a focus on the strong support of, and being a catalyst for, an expanding and dynamic arts community in Red Wing and the surrounding area. The RWAA proudly serves the community through artistic leadership, interactive education, and innovation programming. They are a volunteer, non-profit organization that supports emerging, established, and enduring artists. Visit www.redwingartsassociation.org/. Editor’s Note: Contact publicist for artwork to accompany article. About Firefly PublicityVisit http://www.fireflypublicity.com for more information about its public relations services for outdoor products. Firefly Publicity works closely with writers and editors to place products in media like magazines, newspapers, on-line content, radio and television.Public relationsisacost effective way for companies to maximize their marketing or advertising budget. Firefly Publicity is a results-oriented pr firm located in Red Wing, Minnesota. If you’re interested in gaining exposure for your company’s products, please contact Kim Emery at Firefly Publicity.